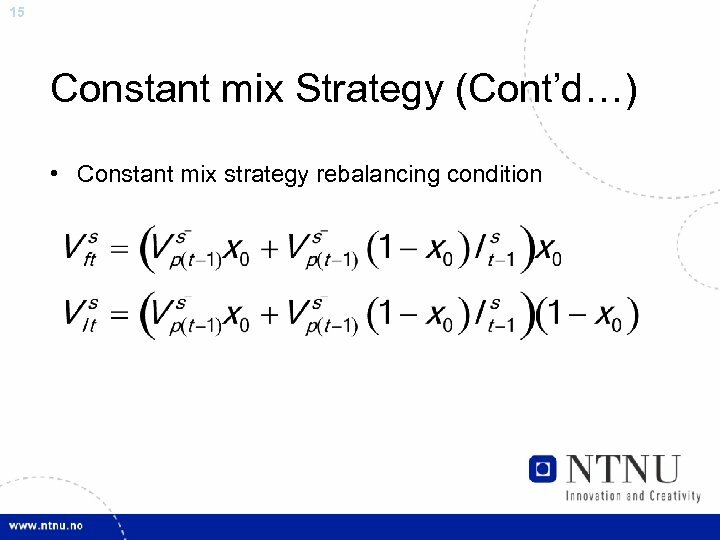 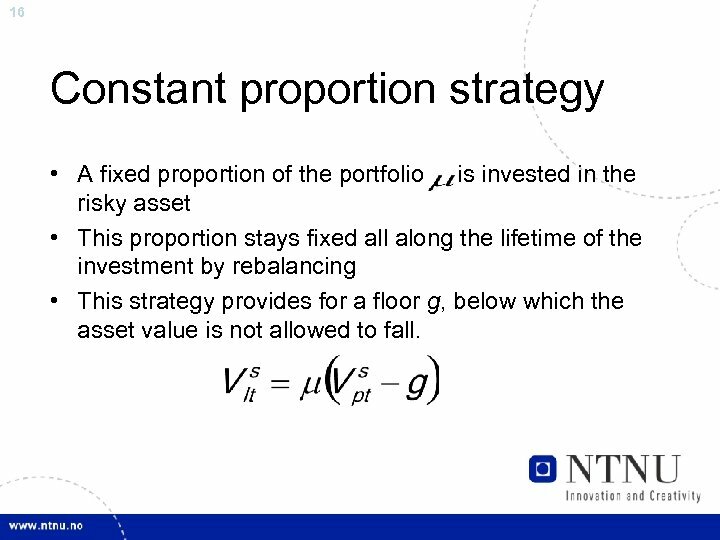 16 Constant proportion strategy • A fixed proportion of the portfolio is invested in the risky asset • This proportion stays fixed all along the lifetime of the investment by rebalancing • This strategy provides for a floor g, below which the asset value is not allowed to fall. 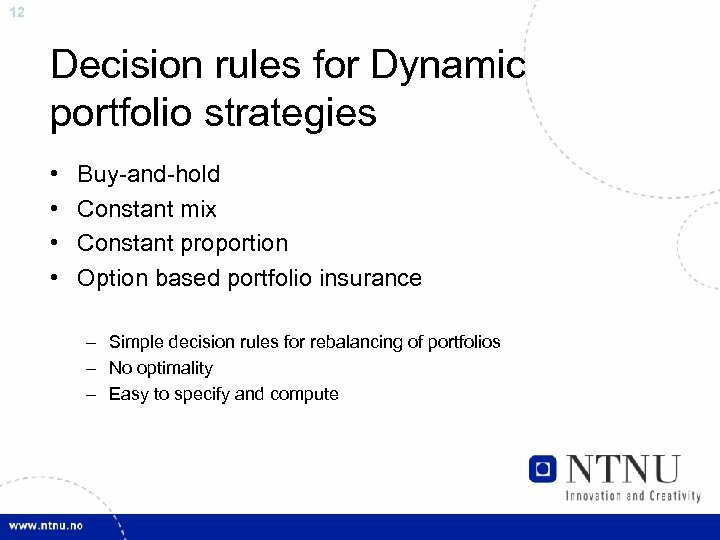 17 Option-based portfolio insurance • A mix of risk free and risky asset such that the payoff scheme matches the one of a portfolio composed of risk free assets and call options • The risk free assets are kept equal to the floor of the portfolio and any excess value is invested in call options. 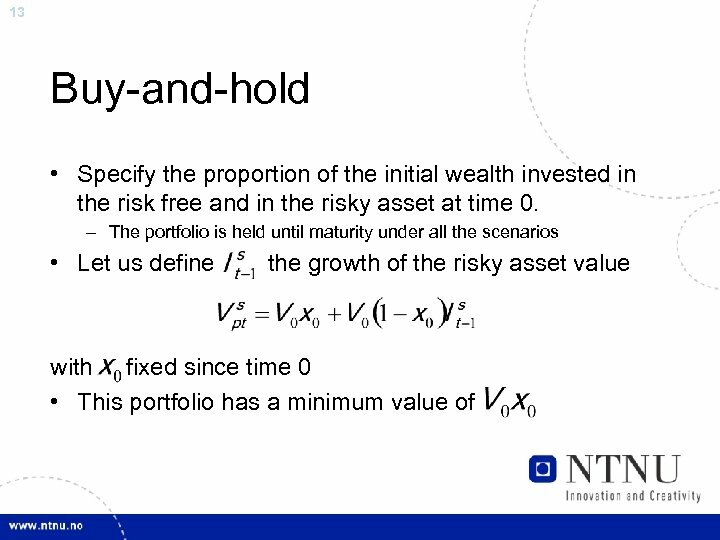 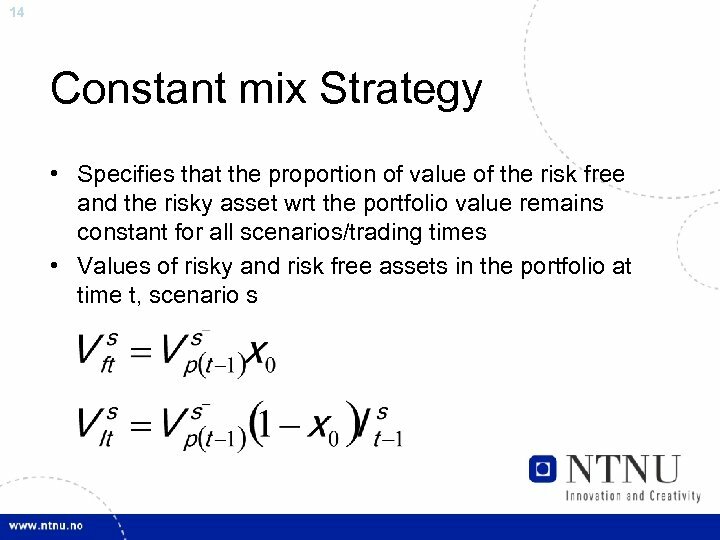 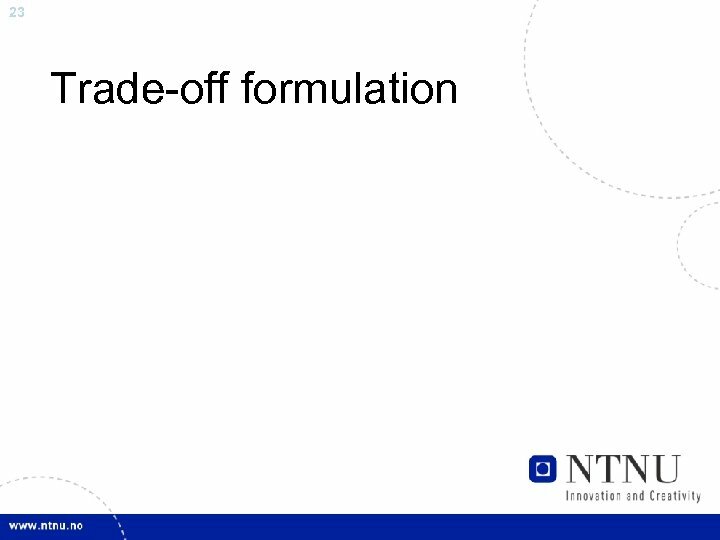 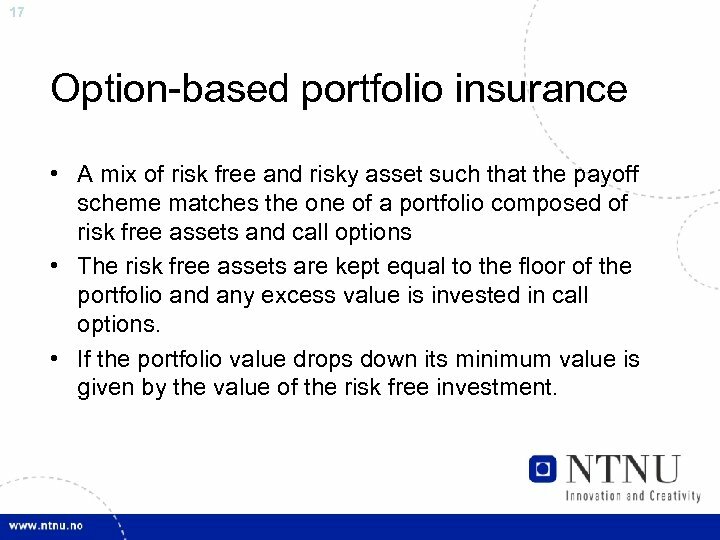 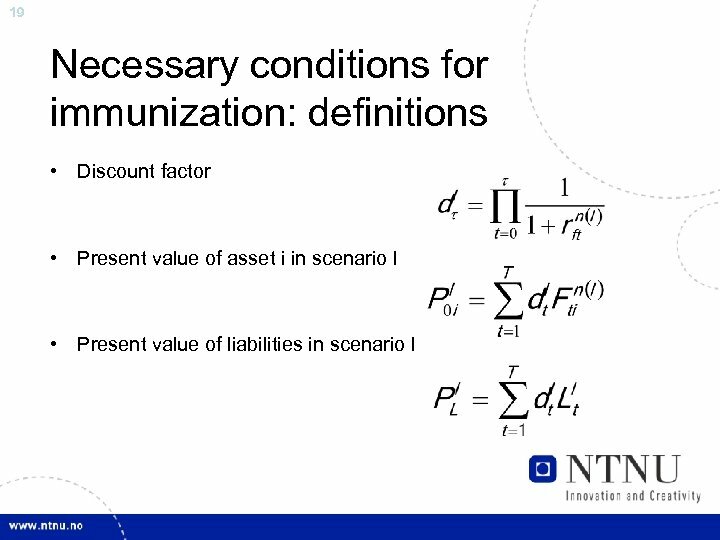 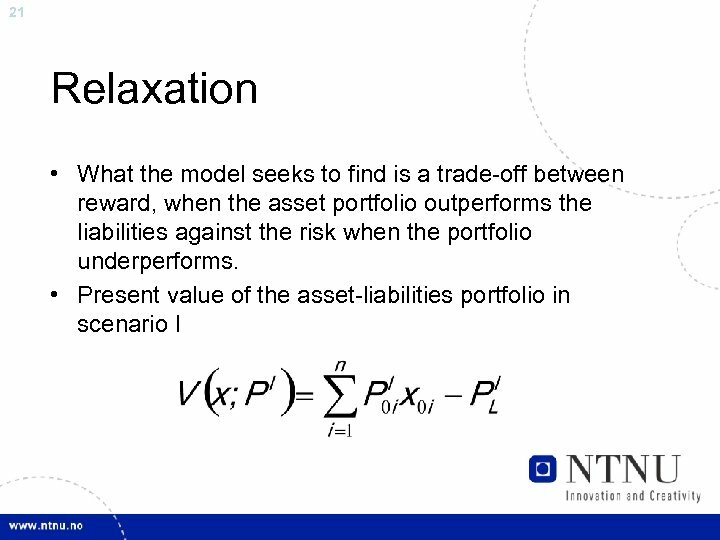 • If the portfolio value drops down its minimum value is given by the value of the risk free investment. 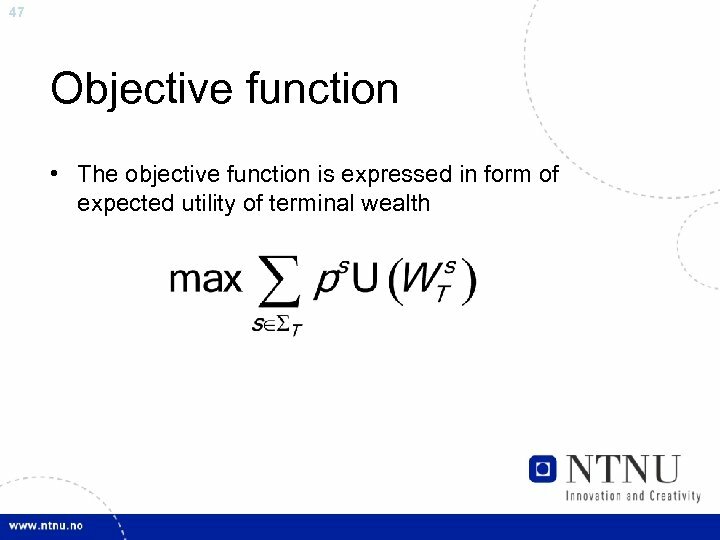 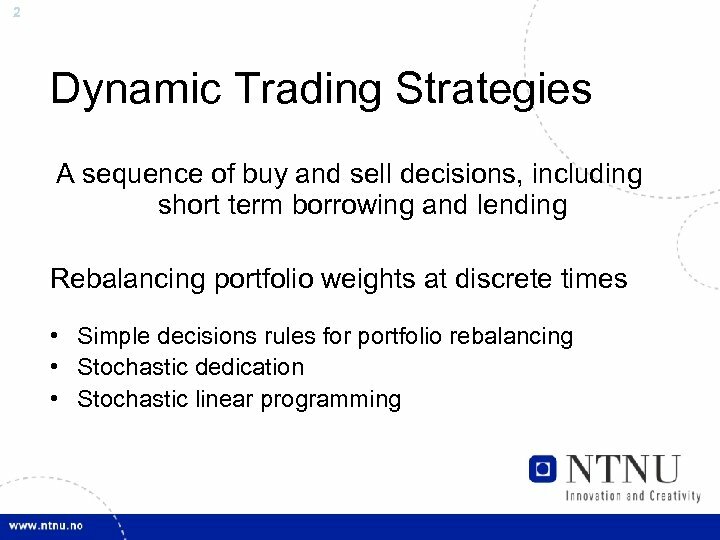 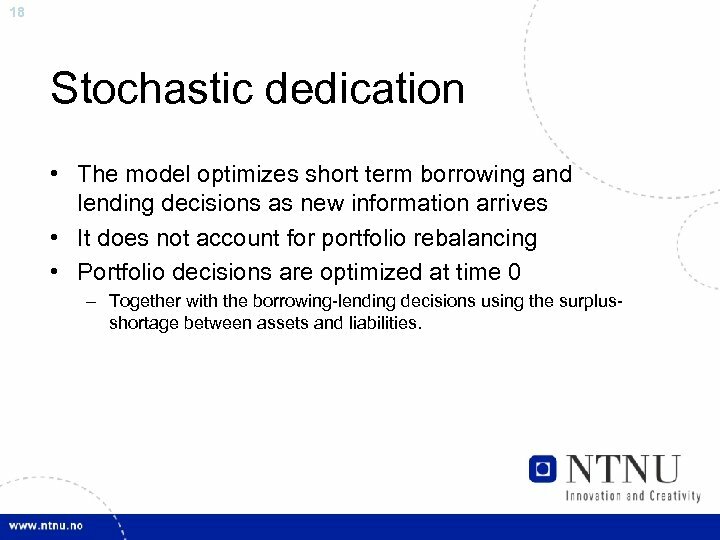 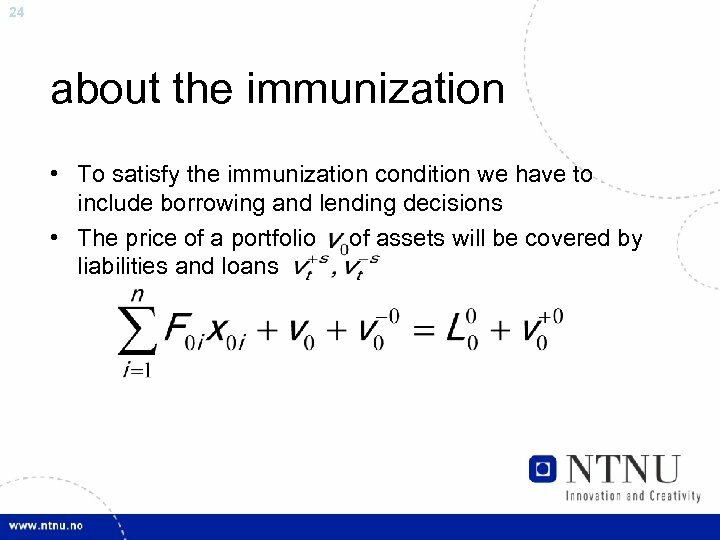 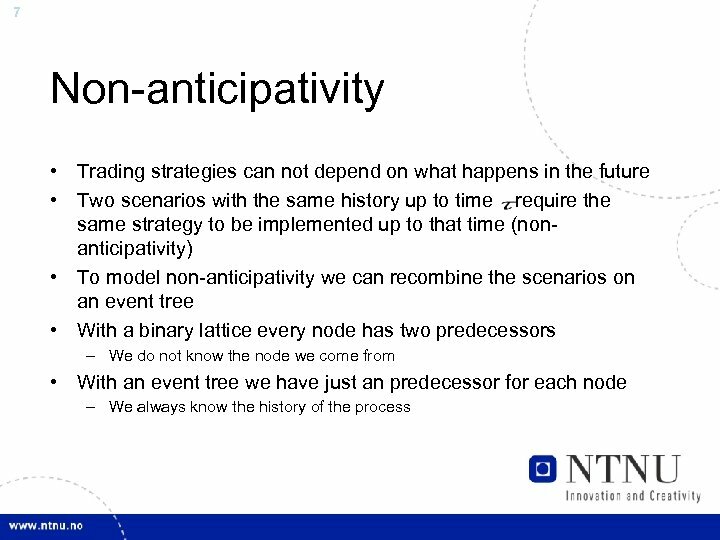 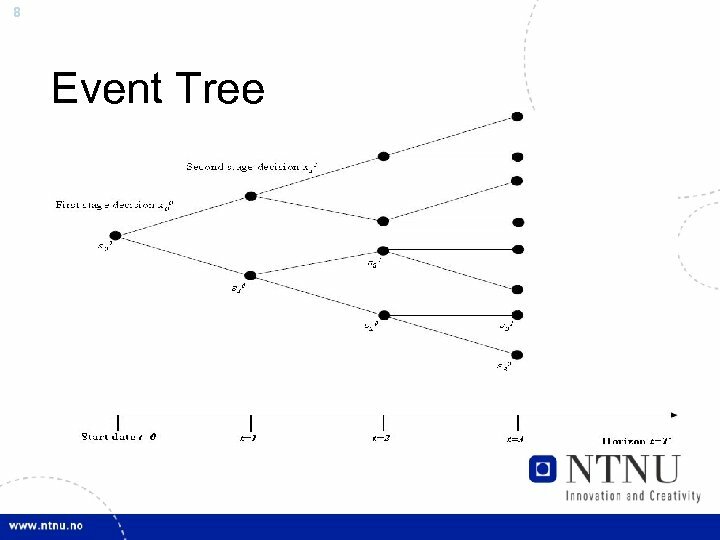 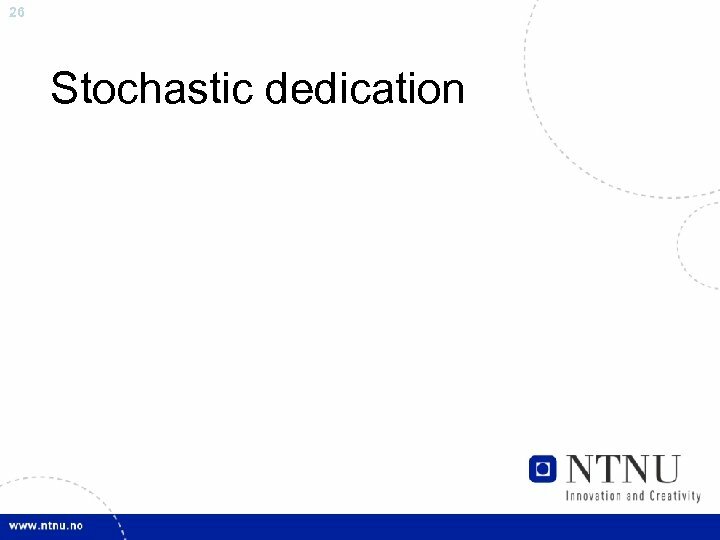 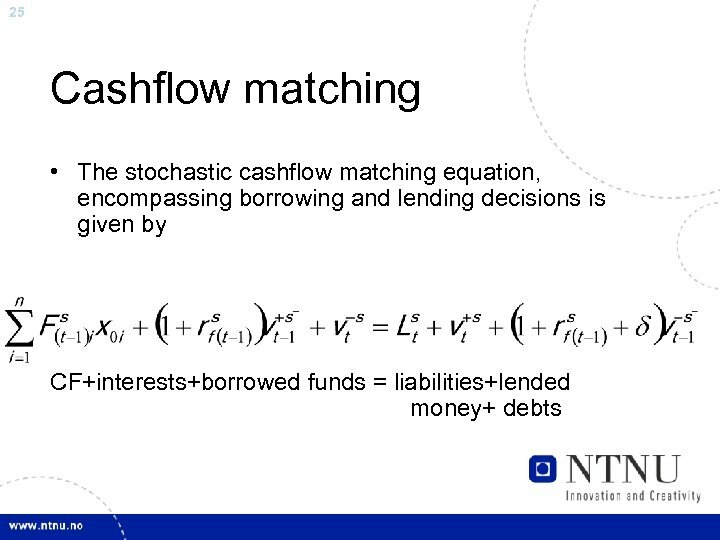 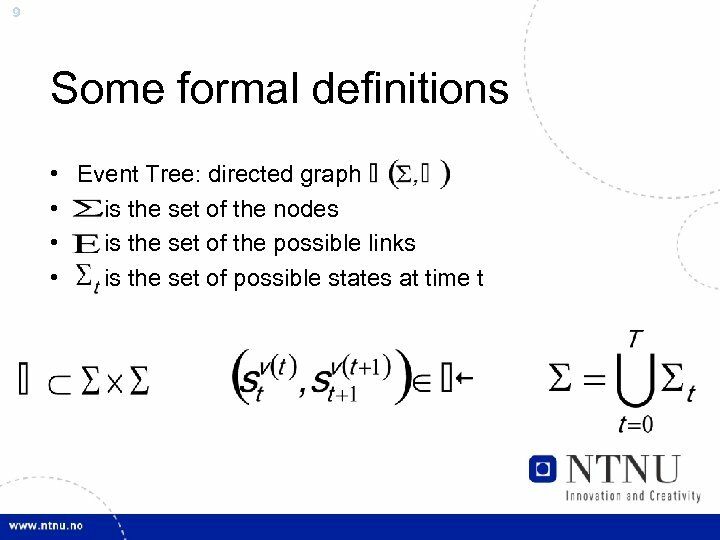 18 Stochastic dedication • The model optimizes short term borrowing and lending decisions as new information arrives • It does not account for portfolio rebalancing • Portfolio decisions are optimized at time 0 – Together with the borrowing-lending decisions using the surplusshortage between assets and liabilities. 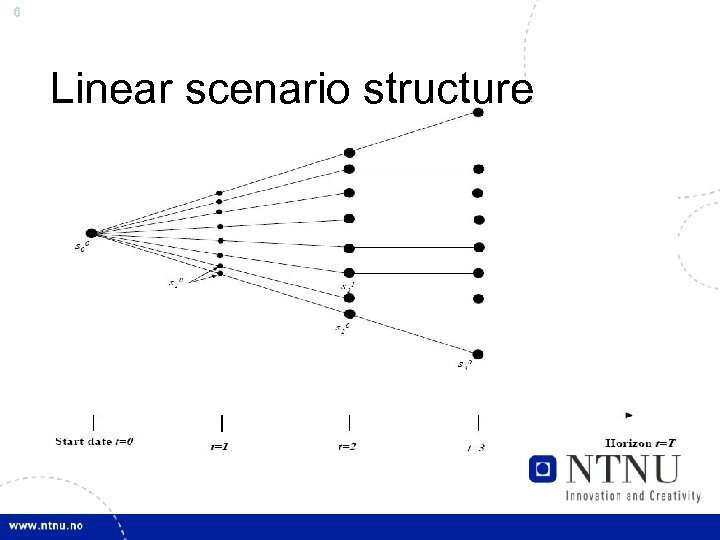 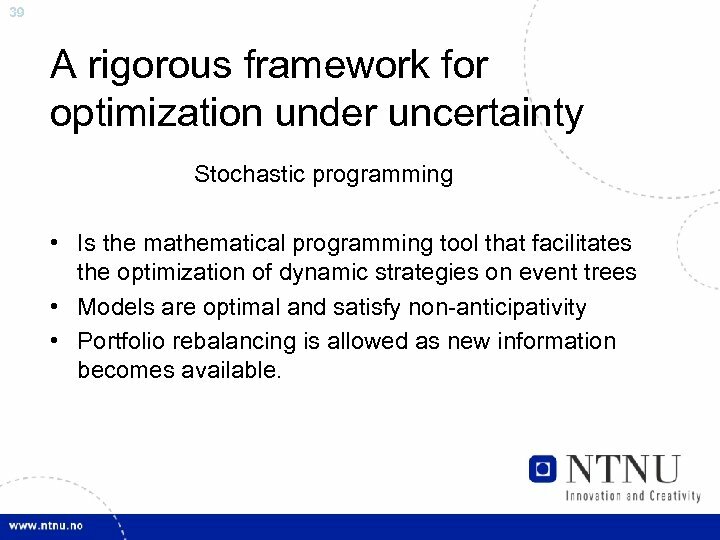 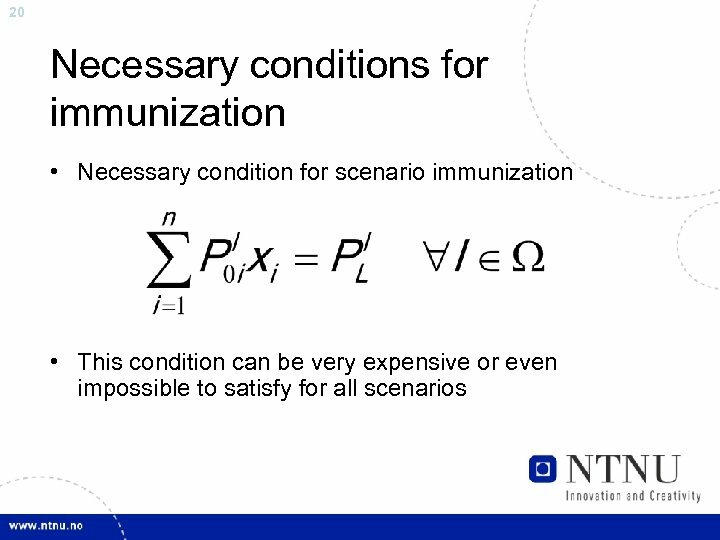 39 A rigorous framework for optimization under uncertainty Stochastic programming • Is the mathematical programming tool that facilitates the optimization of dynamic strategies on event trees • Models are optimal and satisfy non-anticipativity • Portfolio rebalancing is allowed as new information becomes available. 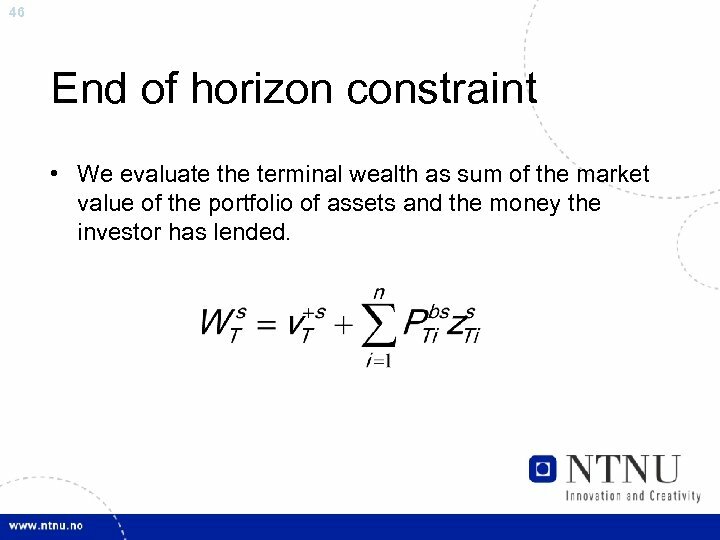 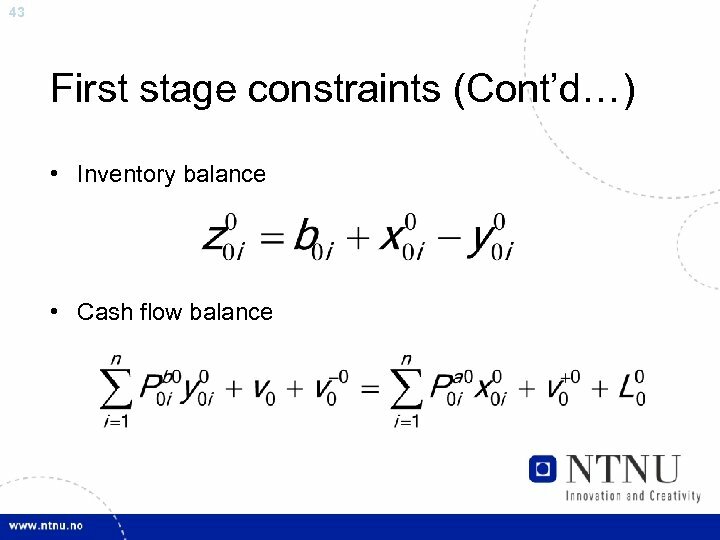 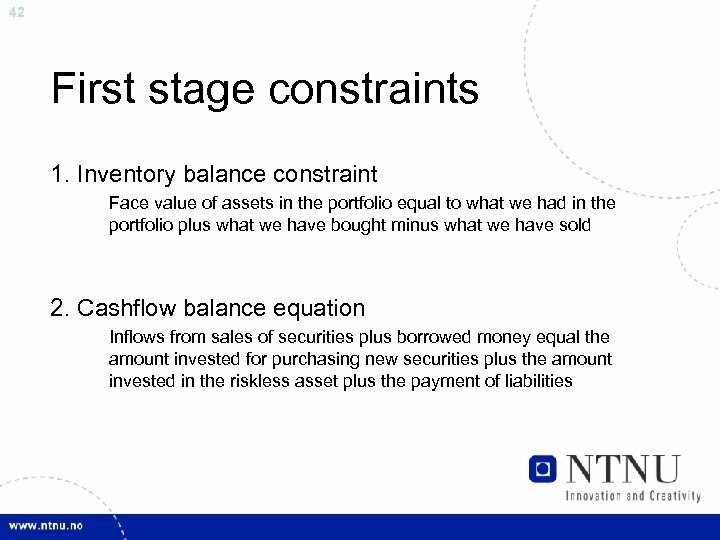 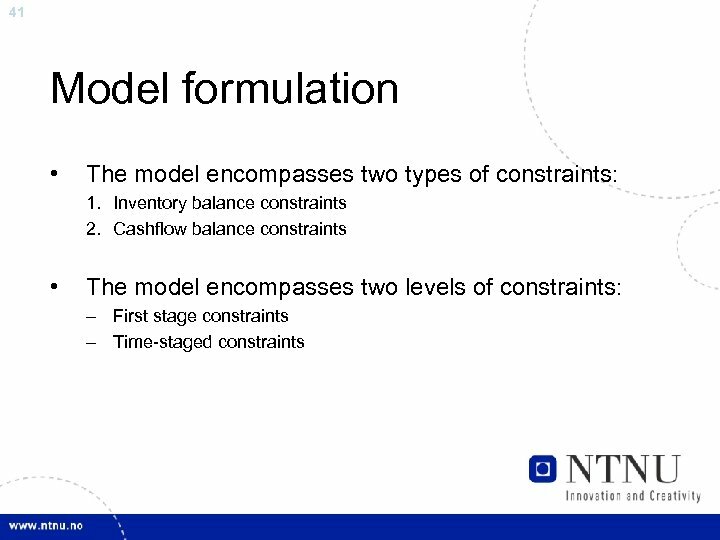 46 End of horizon constraint • We evaluate the terminal wealth as sum of the market value of the portfolio of assets and the money the investor has lended. 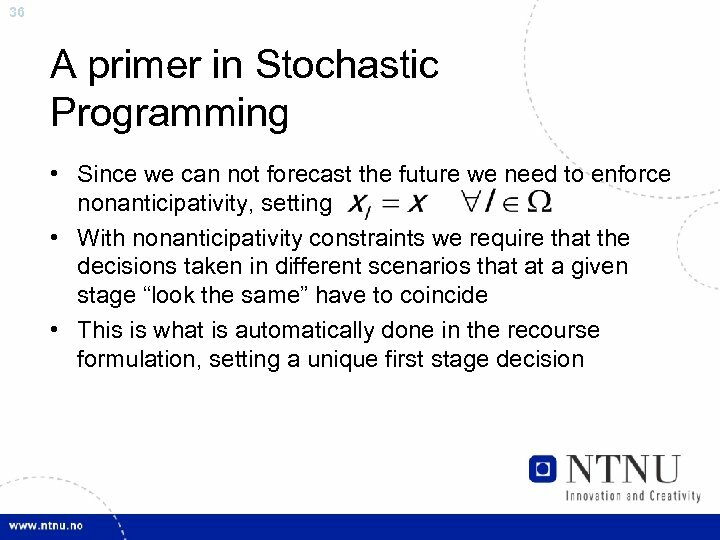 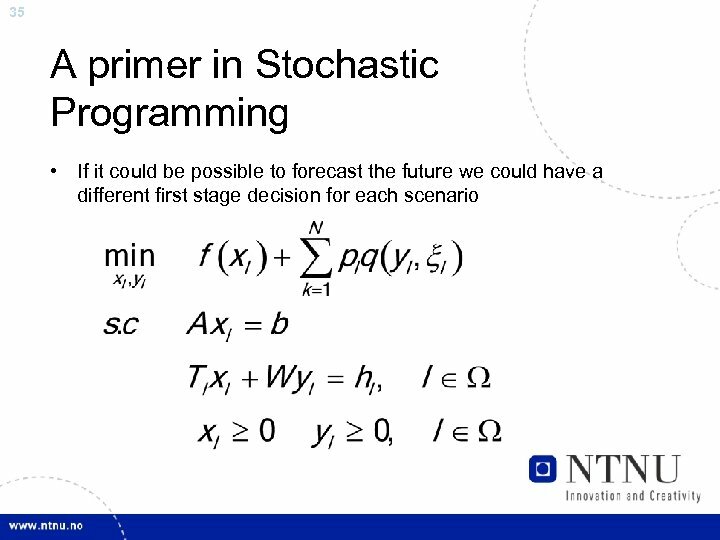 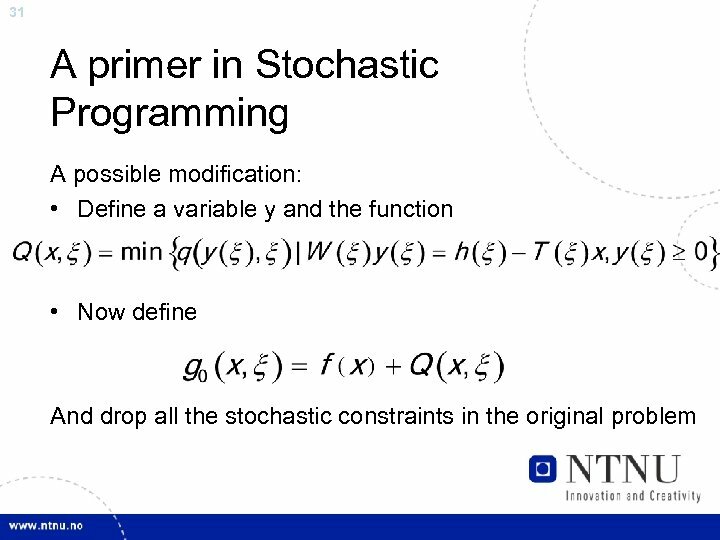 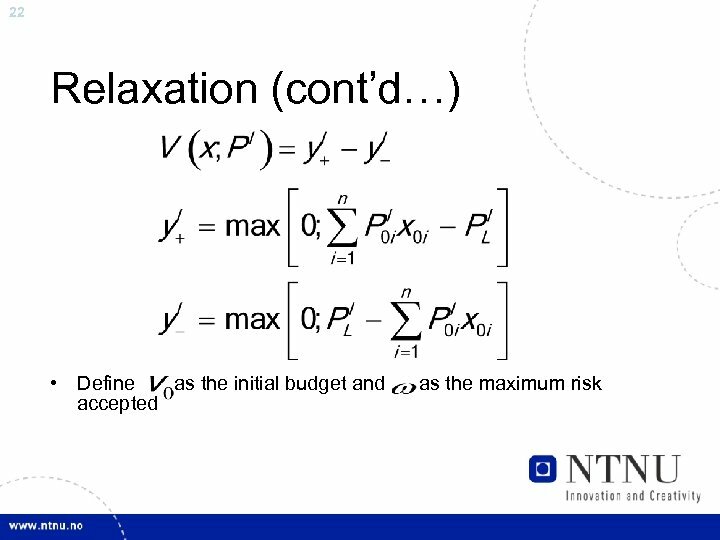 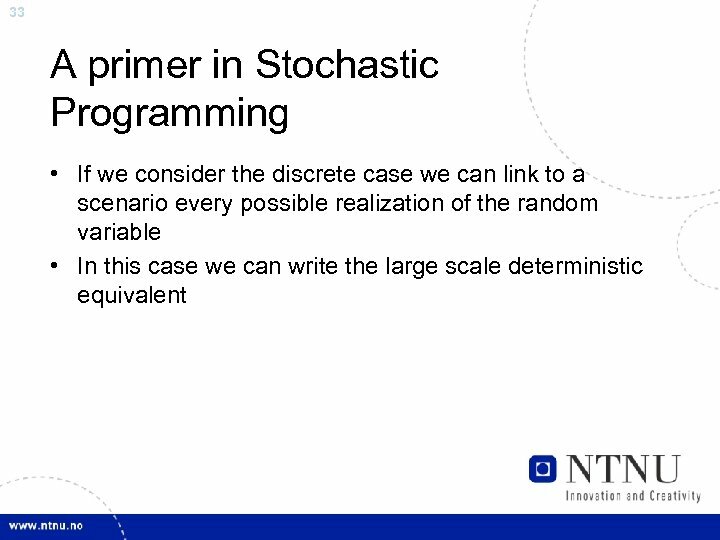 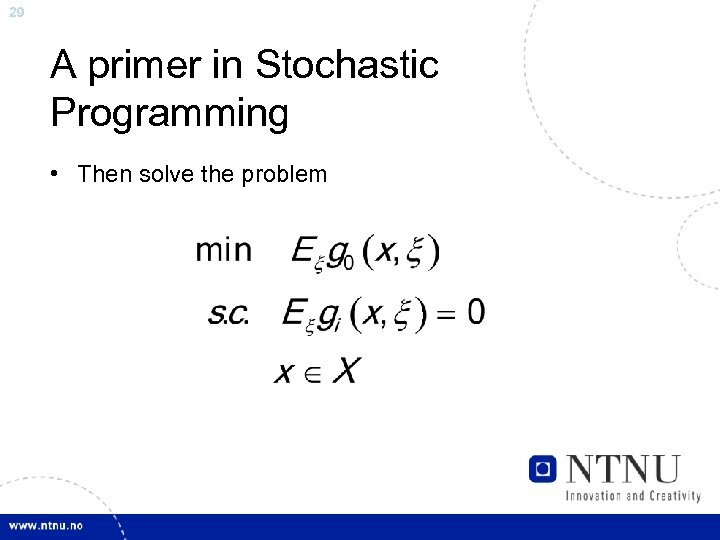 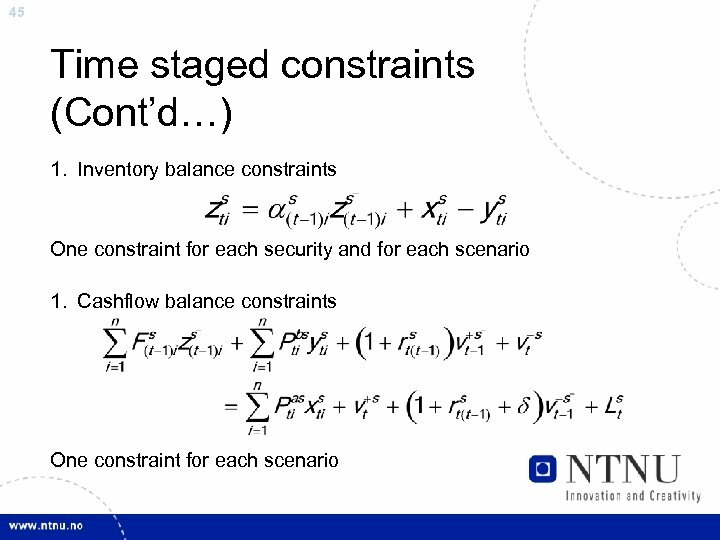 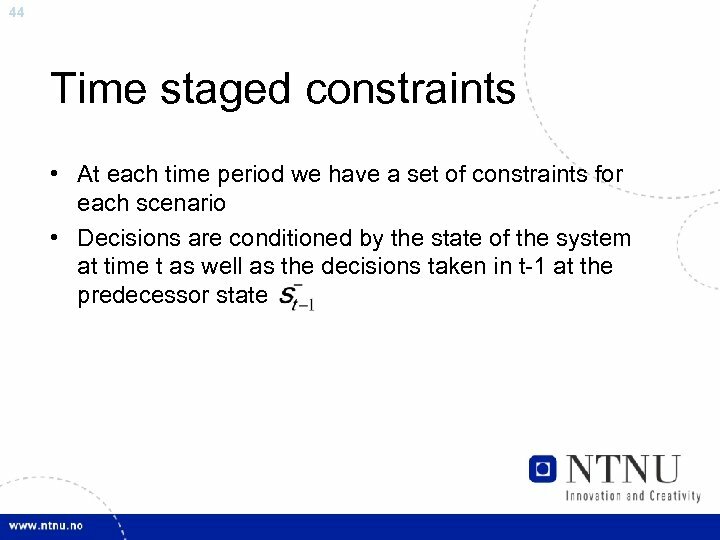 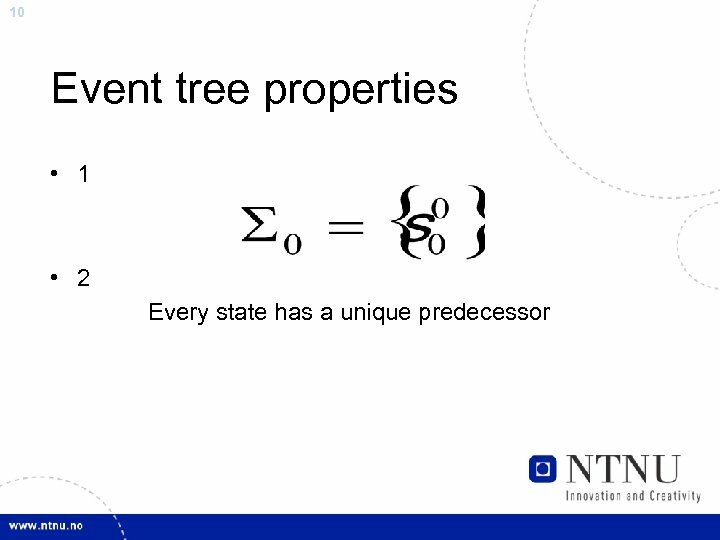 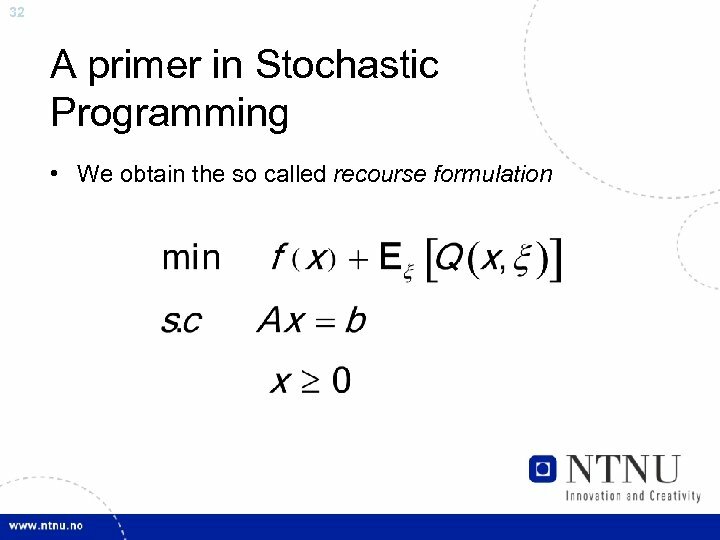 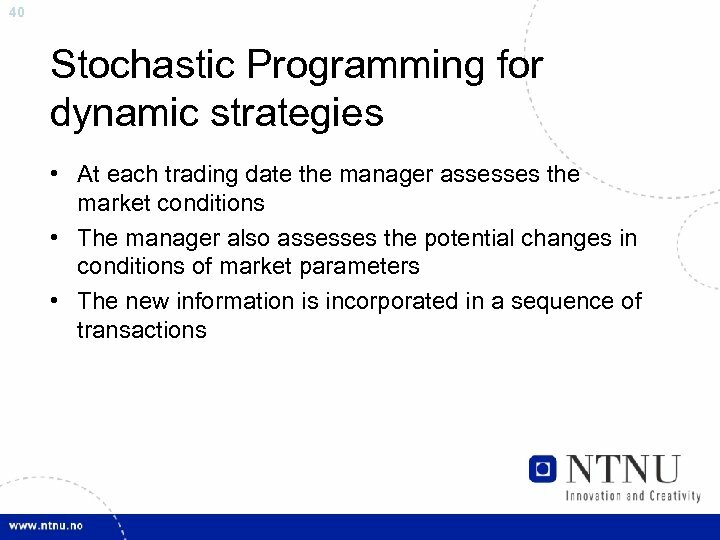 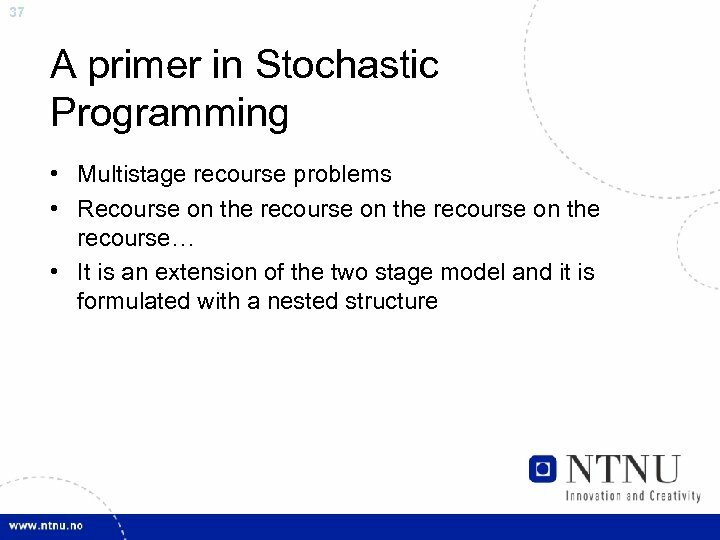 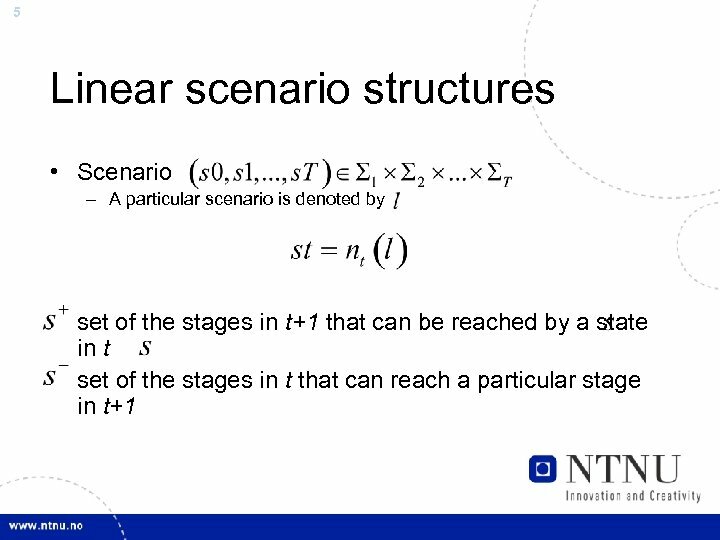 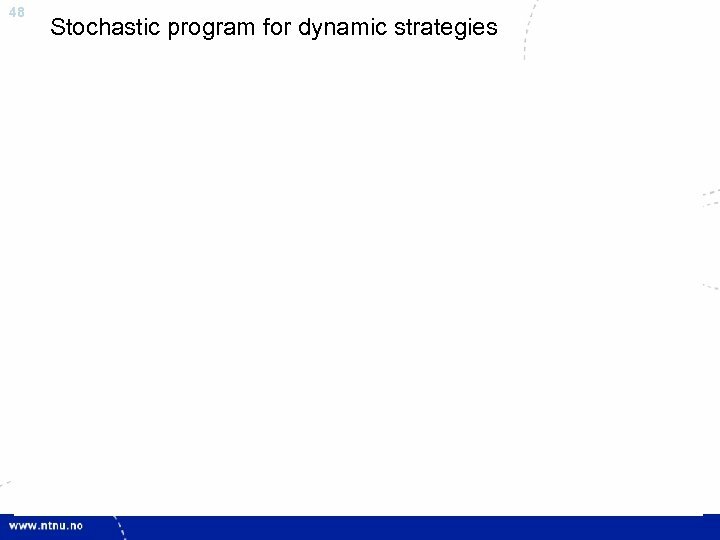 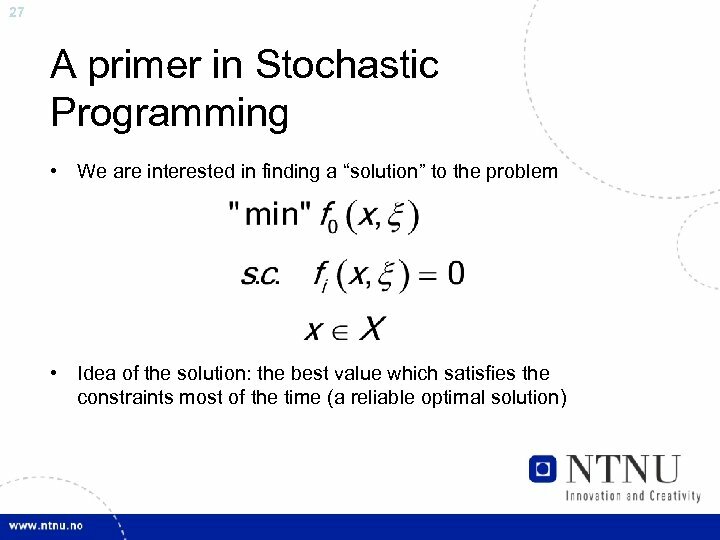 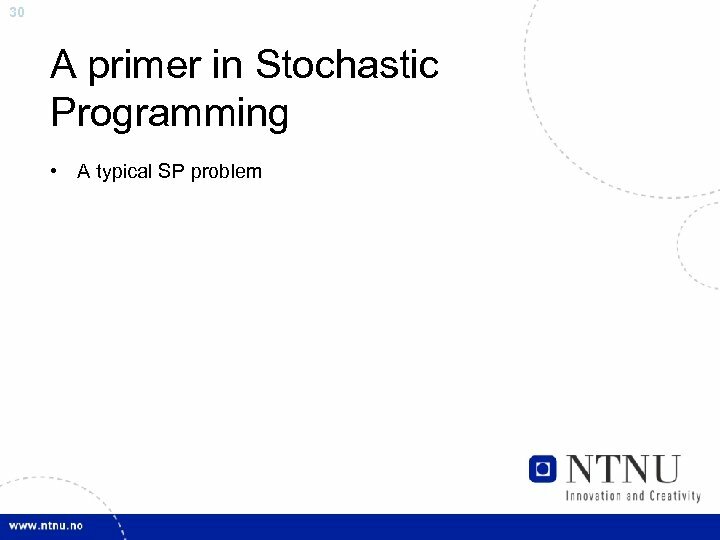 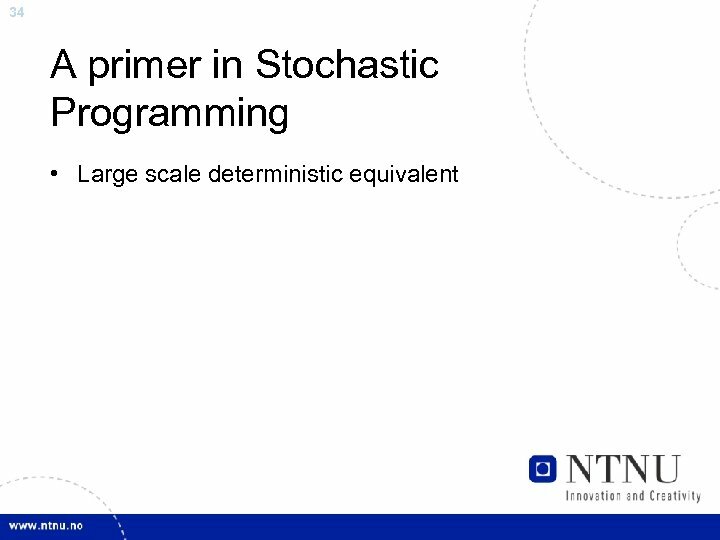 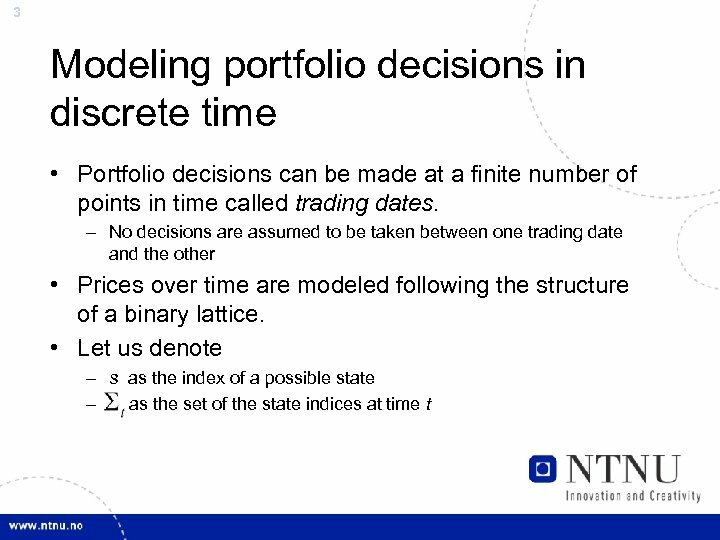 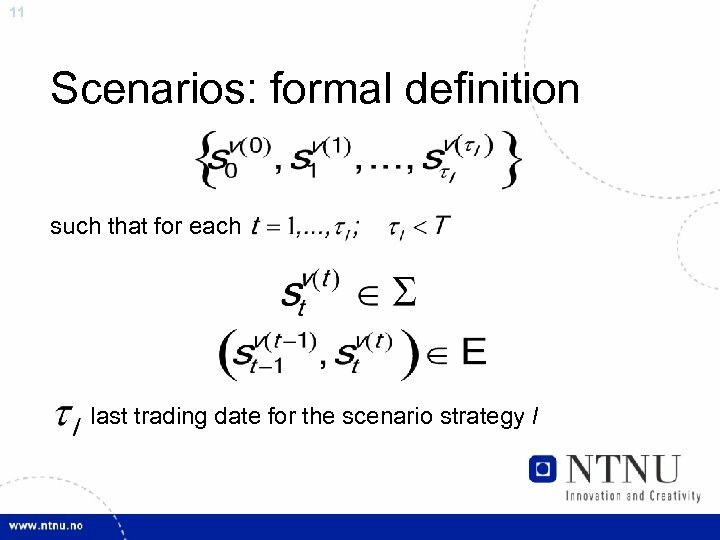 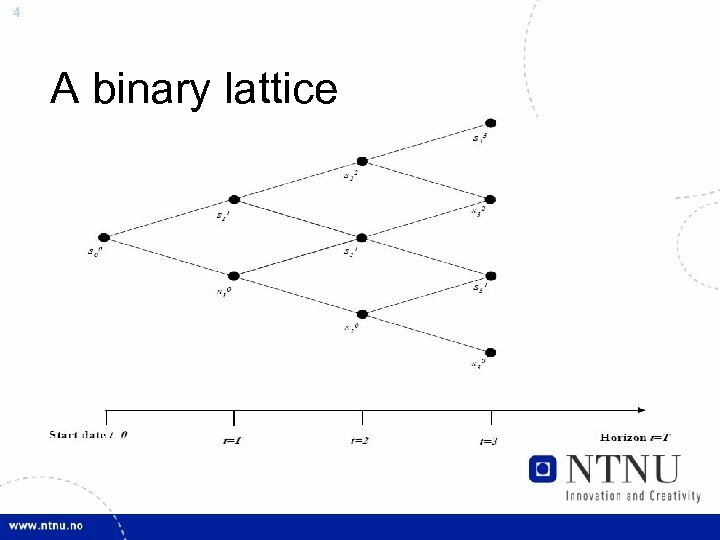 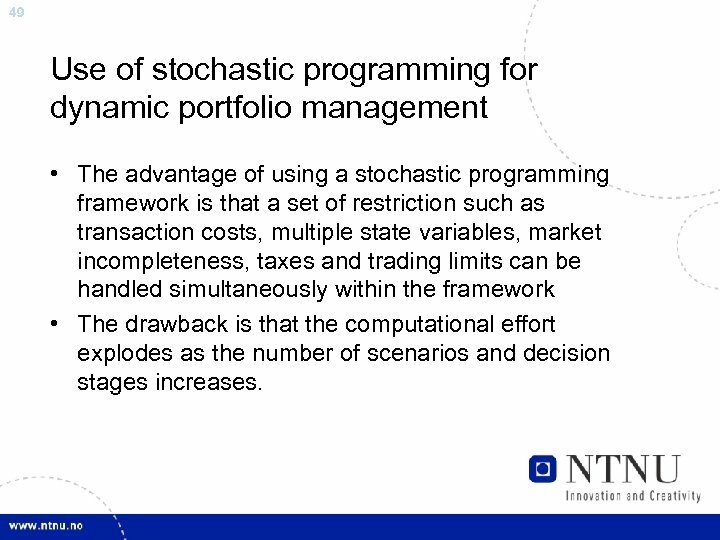 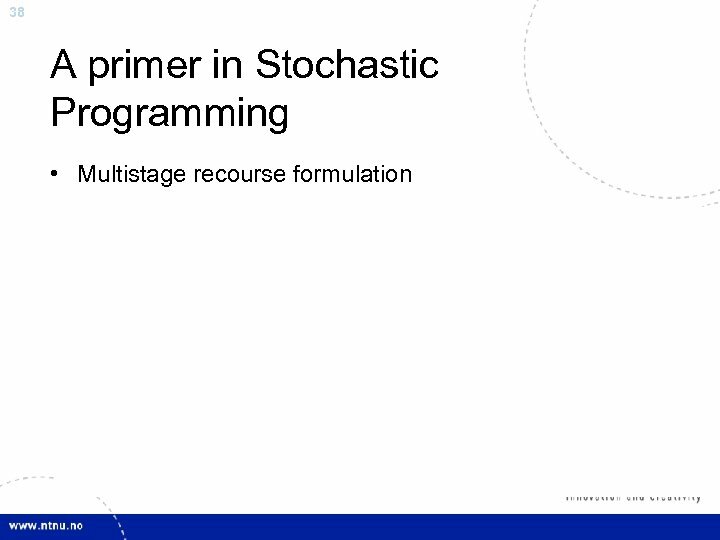 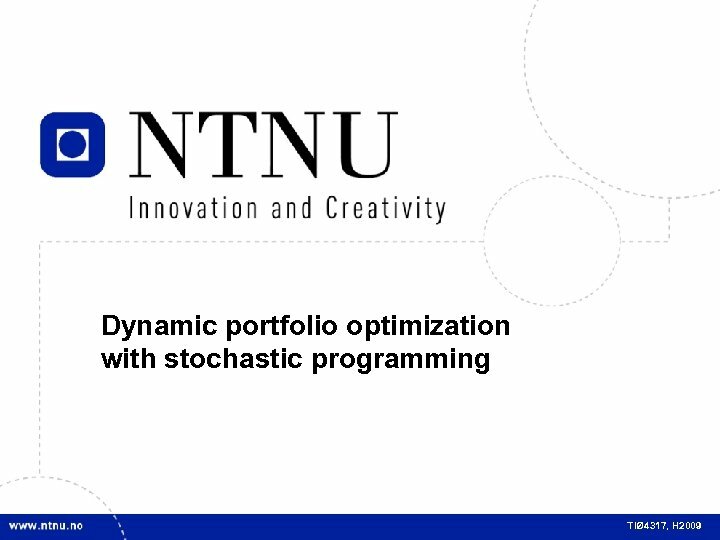 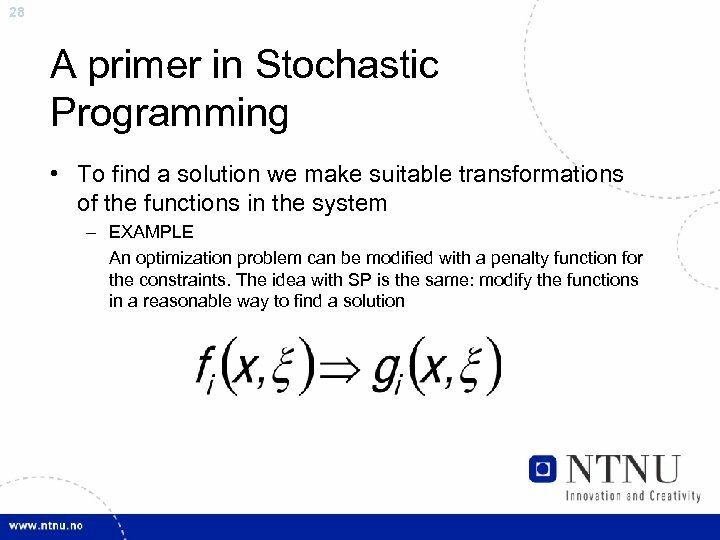 49 Use of stochastic programming for dynamic portfolio management • The advantage of using a stochastic programming framework is that a set of restriction such as transaction costs, multiple state variables, market incompleteness, taxes and trading limits can be handled simultaneously within the framework • The drawback is that the computational effort explodes as the number of scenarios and decision stages increases.